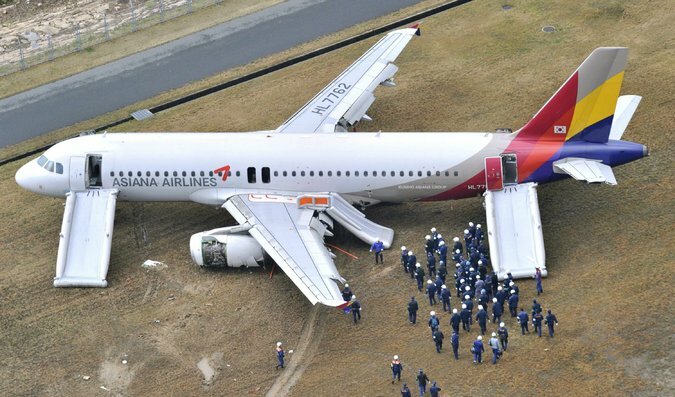 SEOUL, South Korea - South Korea said on Wednesday that it would review the qualifications of all the pilots of Airbus A320 passenger jets flown by carriers based in the country, one day after one of the airplanes skidded off a runway while landing at Hiroshima Airport in Japan. Twenty-five people had minor injuries in the accident on Tuesday, according to the South Korean carrier Asiana Airlines. The Airbus A320, operated by Asiana, approached the runway so low that it clipped a 20-foot-tall wireless communication tower that stood almost 1,000 feet before the runway. Two years ago, another Asiana plane, a Boeing 777, crashed at San Francisco International Airport after its tail touched a sea wall as the jet came in too low. The accident, said to have been caused by pilot error, left three people dead and more than 180 injured. Japanese news reports about Tuesday's accident included photographs that showed damage to the communications tower, which was used to send signals to incoming planes. Part of the tower's antenna was found stuck in the plane's landing gear, they said. On Wednesday, the South Korean Ministry of Land, Infrastructure and Transport called in the top managers of all South Korean airline companies to instruct them to bolster airplane maintenance and pilot training. It also told reporters that it would conduct a review of all Airbus A320 pilots for job suitability, especially checking their ability to deal with emergencies. Yeo Hyung-ku, vice minister for transport, said that airline companies needed to consider the mental state of pilots as a potential cause of an accident, in an apparent reference to the pilot at the controls of the Germanwings jetliner that crashed into the French Alps last month. All 11 Airbus A320 jets in South Korea are operated by Asiana and its affiliate, Air Busan. The Asiana plane involved in the Hiroshima accident was carrying 73 passengers and eight crew members from Incheon International Airport in South Korea. It careered off the tarmac and rotated almost 180 degrees before coming to a halt on the grass beside the runway. All the passengers were evacuated using escape chutes. The Air Safety Institute regained control of its Facebook page April 14, within 24 hours after hackers hijacked the page, posted inappropriate content, and thwarted all of the association's attempts to take back control of the page. Staff at Facebook helped AOPA regain control of the page and eliminate the posts. AOPA is taking additional security measures to prevent this from happening again. The hijacking appears to be from the same hackers who recently took over the Facebook pages of other highly visible brands. Facebook told AOPA it is investigating the hackers and their methods; the social media company said it will report back with its findings once the investigation is complete. The hack was isolated to the Air Safety Institute Facebook page and did not affect the association's membership database, member information, or other AOPA products and systems. In order to overhaul these cybersecurity weaknesses, the GAO recommended an "organization-wide threat modeling," which includes, among other things, certification of avionics software and hardware, and ongoing monitoring of security controls following the deployment of the new system. The Air Force grounded its entire T-6 Texan II training aircraft fleet and has no immediate schedule to get the planes back in the air, according to Air Education and Training Command. However, the Associated Press reported that most of the planes are expected to be back in the air Wednesday after a fleet-wide inspection was expected to be completed Tuesday night. AETC flies 446 of the turboprop aircraft as entry-level pilot training. The aircraft are largely flown at Columbus Air Force Base, Mississippi; Vance Air Force Base, Oklahoma; and Laughlin Air Force Base and Sheppard Air Force Base in Texas. AETC first stood down the aircraft on April 10 following indications of an engine oil line malfunction, according to AETC. The command is undergoing a fleetwide inspection, called a Time Compliance Technical Order, to determine the next step. "All AETC wings flying the T-6 are meeting the inspection requirements as safely and quickly as possible to minimize impacts to flying training operations," AETC said in a statement. "The personal safety of AETC aircrew members is, as always, the Air Force's primary concern." The Navy and Marine Corps use the same aircraft to train entry-level pilots. The Navy is aware of the Air Force's decision to ground the T-6s, and is monitoring the situation, but has made no decision to ground the plane, according to Lt. Tim Hawkins, a Navy spokesman. The aircraft is among the newest in the Air Force's fleet, first deployed in May 2000 at a unit cost of nearly $4.3 million, according to the Air Force. It is produced by Raytheon Aircraft Co. The former Trans World Airlines terminal at New York's Kennedy Airport could see new life as a hotel under a proposed plan. JetBlue Airways Corp. is angling to get into the hotel business, joining the growing ranks of developers and investors looking for lodging opportunities inside major U.S. airports. The low-cost airline and its partner, New York-based hotel developer MCR Development LLC, are in advanced negotiations with the Port Authority of New York and New Jersey for the rights to turn the iconic Trans World Airlines terminal at Kennedy Airport into a modern hotel, according to people familiar with the matter. Talks could still fall apart, these people said, but the MCR and JetBlue partnership has emerged as the preferred bidder and is in exclusive discussions with the Port Authority. MCR would be the majority investor. The possible deal is the latest sign that airport hotels are emerging as a sweet spot in the lodging sector as developers and investors seek new ways to tap top-tier cities without paying premiums for downtown addresses. Airport properties have long generated reliable business from flight crews, stranded passengers and early fliers. But as occupancy levels at these hotels have reached new highs, analysts say they are increasingly attracting business from travelers who want to fly in, meet and go home, rather than spend time getting in and out of crowded downtown districts. The municipal owners of airports, meanwhile, are looking to make their facilities more attractive by providing convenient, swankier lodging. Other projects are taking shape across the country, from San Francisco to Atlanta. Minneapolis-based hotel developer Graves Hospitality Corp. is preparing to break ground on a $100 million luxury hotel, with spa, swimming pool and roof deck bar, at the Twin Cities' international airport. In Denver, a Westin airport hotel is slated to open before the end of the year. "Airport locations are hot," says R. Mark Woodworth, senior managing director at PKF Hospitality Research, a hotel consultant and appraiser. Analysts say these properties have become a popular route to penetrating major urban markets where opportunities may be limited. Hotel occupancy rates at airports hit a record high of 72.5% in 2014, according to data tracker STR Inc. These levels are influenced to some degree by rising levels air travel, but the steady ascent from less than 60% in 2009 suggests airport hotels are improving alongside other types of lodging. While that level is on par with city center hotels, the average daily rate for airport hotels was about $103, or about 63% less than downtown lodging. That is largely because many of the existing airport hotels are of older, no-frills stock. Most of the new airport projects are more luxurious, allowing operators to charge higher rates. "There is a good opportunity for investors in airport hotels to close that gap," Mr. Woodworth says. Benjamin Graves, Graves Hospitality's chief executive officer, says because his luxury airport hotel will be between downtown Minneapolis and St. Paul, and will be a short drive to the Mall of America, "we anticipate we will be the highest for room rates" in the area market. Developers often can negotiate for a monopoly, or near-monopoly, on lodging that sits directly on airport property, offering an edge over hotels that ring airports. Some also can take advantage of cities' plans to upgrade airport facilities and install new amenities, from designer boutiques and movie theaters to sleek rail systems that connect terminals. Denver International Airport has plans for concerts, festivals and art shows in and around the 519-room Westin hotel set to open in the fall. "We hope this bring locals to the airport," says Kap Malik, a design director for Gensler, the architecture firm behind the Denver project. The developers face some unusual hurdles. Airport locations are governed by Federal Aviation Administration rules, and there are numerous restrictions around security and building dimensions, says Scott Berman, the U.S. leader of hospitality at PricewaterhouseCoopers. Windows, for example, need to be soundproofed to muffle the roar of jet engines. "They are incredibly expensive to build," Mr. Berman says of airport hotels. Developers might have to spend 10% more at an airport compared with other types of hotels and often have to negotiate for public subsidies to make up the difference, he added. The campaign to transform Kennedy Airport's famed TWA terminal to a hotel has been marked by several twists and turns. The landmark Eero Saarinen-designed property opened in 1962. 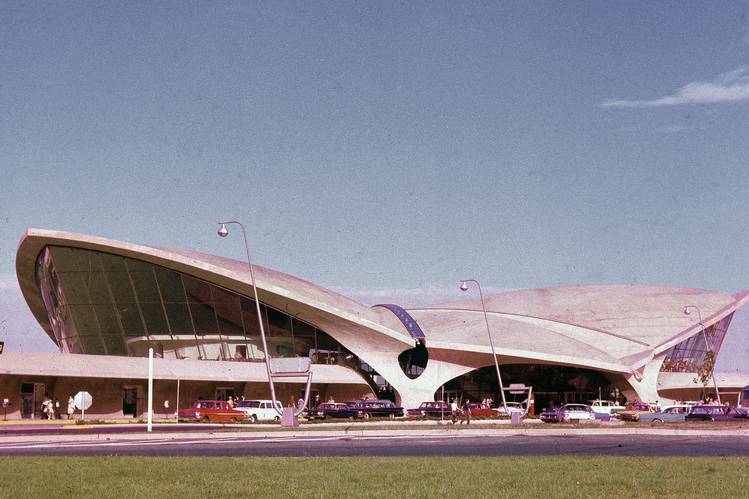 With its curved, winged shape that suggested flight itself, the TWA Flight Center became an icon of the jet-set era. The building closed in 2001, after TWA ceased operations. The Port Authority of New York and New Jersey in 2008 spent $20 million to remove asbestos and restore the interior to make it more attractive to developers. Hotelier Andr� Balazs initially won the rights to develop the hotel in 2013 but dropped out before getting started. "It was going to take so long and we had more interesting opportunities," he told the Journal last year. The Port Authority relaunched the bidding process last year and narrowed its interest to MCR and JetBlue and Mr. Schrager's group, which included private-equity firm Ares Management and New York real-estate investor Steve Witkoff for a $400 million project. MCR intends to build about 500 rooms said a person briefed on the plan. The hotel project, JetBlue's first, would open across from its main terminal at the airport.